Instant rebates: Consumers receive the rebate at the time of purchase. It is generally available to anyone who purchases the product without further conditions. Mail-in rebates: Consumers apply for the rebate after the purchase, by mail-in application, online or by other means. Rebates can be beneficial to both consumers and businesses. For consumers, rebates can result in lower effective prices. For businesses, rebates provide a flexible tool that may increase the volume of sales. However, when rebates are not promoted or administered correctly, consumers may ultimately pay more than intended, and competitors can be unfairly disadvantaged. The Competition Bureau has set out to clarify its position on the main issues raised by consumer rebate promotions. Ottawa, December 14, 2009 – The Competition Bureau is advising consumers to check the fine print of rebate offers to ensure they are getting the deal they think they are. Ottawa, September 21, 2009 — The Competition Bureau today published its Enforcement Guidelines on Consumer Rebate Promotions. The purpose of the Guidelines is to clarify the Competition Bureau’s approach to interpreting the false or misleading representations provisions of the Competition Act , the Consumer Packaging and Labelling Act and the Textile Labelling Act in the area of consumer rebate promotions. Health Canada provides timely information on issues that concern the health of Canadians. The Recalls and Safety Alerts Database provides easy access to a comprehensive list of recalls, advisories, and safety alerts. This database includes recalls from Health Canada, the Canadian Food Inspection Agency, and Transport Canada. You can report an adverse reaction or a problem with a product. Reporting may include adverse reactions related to the use of drugs, blood products, natural health products and vaccines, or problems related to the safe use other products such as cosmetics, a range of household, child and consumer electronic products, medical devices, pesticides and food. In the new edition, five basic symbols identify care treatments for washing, bleaching, drying, ironing and professional cleaning. The symbols are in black and white, replacing the previous edition's "traffic-light" colours of green, amber and red. The temperature of a treatment appears either in degrees Celsius or is defined by a series of dots (a hand iron symbol with one dot means the garment can be safely ironed at a temperature of 110°C). And bars help illustrate the severity of the treatment (one bar below a wash tub means the garment should be machine washed using a mild treatment). Other symbols define techniques for professional cleaning, hand washing, and natural drying — dry flat, line dry, drip dry, dry in the shade. Wash in commercial machine in water not exceeding 95°C, at normal setting. Wash in commercial machine in water not exceeding 95°C, at permanent press setting. Wash in domestic or commercial machine in water not exceeding 70°C, at normal setting. Wash in domestic or commercial machine in water not exceeding 60°C, at normal setting. Wash in domestic or commercial machine in water not exceeding 60°C, at permanent press setting. Wash in domestic or commercial machine in water not exceeding 50°C, at normal setting. Wash in domestic or commercial machine in water not exceeding 50°C, at permanent press setting. Wash in domestic or commercial machine in water not exceeding 50°C, at delicate/gentle setting. Wash in domestic or commercial machine in water not exceeding 40°C, at normal setting. Wash in domestic or commercial machine in water not exceeding 40°C, at permanent press setting. Wash in domestic or commercial machine in water not exceeding 40°C, at delicate/gentle setting. Wash in domestic or commercial machine in water not exceeding 30°C, at normal setting. Wash in domestic or commercial machine in water not exceeding 30°C, at permanent press setting. Wash gently by hand in water not exceeding 40°C. Wash in domestic or commercial machine at any temperature, at normal setting. Use any bleach when needed. Tumble dry at high heat (not exceeding 75°C) at normal setting. Tumble dry at medium heat (not exceeding 65°C) at normal setting. Tumble dry at medium heat (not exceeding 65°C) at permanent press setting. Tumble dry at low heat (not exceeding 55°C) at permanent press setting. Tumble dry no heat/air dry. Hang up the soaking wet article to "drip" dry. After extraction of excess water, dry the article on a suitable flat surface. Dry in the shade (symbol added to line dry, drip dry, or dry flat). Do not dry. To be used with "Do not wash" symbol . Iron with or without steam by hand, or press on commercial equipment, at a high temperature (not exceeding 200°C). Recommended temperature for cotton and linen textiles. Iron with or without steam by hand, or press on commercial equipment, at a medium temperature (not exceeding 150°C). Recommended temperature for polyester, rayon, silk, triacetate and wool textiles. Iron with or without steam by hand, or press on commercial equipment, at a low temperature (not exceeding 110°C). Recommended temperature for acetate, acrylic, modacrylic, nylon, polypropylene and spandex textiles. Dry-clean, normal cycle. Petroleum solvent only. For more information on the Canadian General Standards Board (CGSB) and how to order the standard CAN/CGSB-86.1-2003, please visit their website at www.tpsgc-pwgsc.gc.ca/ongc-cgsb/index-eng.html, or call 819-956-0425 or 1-800-665-2472. Think you may have bought a "lemon"? Have you recently purchased a car that always seems to have the same problem that no mechanic can fix? You may have bought a "lemon". Generally speaking, a "lemon" is a term often used to describe a vehicle with a manufacturer's defect that may affect its safety, use or value. The definition of a "lemon" can vary according to the jurisdiction of the vehicle. While there are no "lemon laws" in Canada, there are measures in place to help if you think you may have purchased a defective vehicle. The best way to avoid purchasing a "lemon" is to review the past maintenance history of the vehicle before purchasing. To do so, ask for the Vehicle Identification Number (VIN) of the vehicle you are thinking of purchasing. Used vehicle dealers may be selling used vehicles that they have previously purchased in Canada or sometimes that they have imported, most often from the United States. If the used vehicle you are thinking of purchasing has been previously purchased by the dealer in Canada, go to CAMVAP to check whether the vehicle was subject to a manufacturer buyback in the past. You can also conduct a search of the vehicle maintenance history using the VIN of the vehicle. Some private firms will conduct searches of the maintenance history of a vehicle's for a fee. To find a firm, try searching "vehicle history report" in a search engine on the Internet. If the used vehicle you are thinking of purchasing has been imported by the dealer from the United States, the dealer would have been required to obtain information from the manufacturer regarding any outstanding safety recalls, but this does not include the vehicle's status as a "lemon" in the United States. If you know that it is a vehicle imported from the United States ensure that you conduct a maintenance history check that also includes maintenance history in the U.S. Not all firms conduct searches that include U.S. maintenance history. Be sure to ask. If you have unknowingly purchased a defective used vehicle from a Canadian auto dealer, you can contact your provincial or territorial consumer protection authorities. Whether the vehicle was originally purchased by the dealer in Canada or in the United States, consumers purchasing used vehicles in Canada from an auto dealer can check to see how they are protected by their province's or territory's consumer protection laws. For more information about purchasing new or used vehicles, check out the Canadian Consumer Handbook or talk with your provincial or territorial consumer protection authorities. RFID stands for Radio Frequency Identification — a technology whose use is growing fast, and which has major implications for consumers, particularly with regard to privacy. As its name implies, RFID is an ID-identification-system. It relies on a small chip that is implanted in a tag. The chip can record and store data, such as a serial number, price or purchase record. The tag can be attached to all sorts of things: merchandise, shipping containers, vehicles, even pet or animal collars. Then, an electronic scanner can use radio signals to read or track the ID tag. For example, a warehouse worker might use a hand-held RFID reader to check inventory. The data on the tags scanned might only be numbers, but once scanned, the numbers can be checked against a computer database, and the company will know exactly what it has on hand. the Speedpass (TM) keychain, which automatically debits your bank account or credit card when you pump your own gas. It is important for consumers to know about RFID, particularly because it is the technology used by the Electronic Product Code (EPC) system. EPC is replacing bar codes, those parallel bars and spaces found on products and price tags, which are scanned at a store's cash register. What is the difference between a traditional bar code and an RFID/EPC tag? Item rather than product-level tagging. Because RFID/EPC tags have a computer chip with its own electronic memory, each tag can have its own individual identification code-this is beyond the capacity of the traditional printed bar code symbol. Thus, RFID/EPC tags can separately identify and track every individual item. Bar codes, on the other hand, can only identify the product class that an item belongs to. For example, a stack of DVD players sitting on a store shelf could all be the same model, in the same kind of box, and sell at the same price. At present, they would all have the same bar code printed on their boxes or labels; this would indicate merely that they were all the same type of DVD player. In the near future, each could have its own unique RFID/EPC tag, and carry an individual identity code. The store will accordingly be able to track exactly which DVD player is where. The reader can be fixed to a wall, since it does not have to be in direct line of sight with, and "see," a specific tag. Therefore one strategically located reader could replace several, even many, old-style bar code scanners. Not all electronic tags on retail goods are RFID/EPC tags. They may instead be radio frequency (RF) security tags. RF security tags do not have a unique identification number, and do not store data or allow linkages to other databases. These use radio signals to send a code to the store’s security system, and trigger an alarm when a product leaves the premises without the tag having been deactivated. How is RFID now being used in retail? Continuous "live" store inventory. Retailers can gain real-time detailed information on their stock through an on-going automatic scan system in warehouses and stores. This is much more efficient than having an employee manually check inventory on shelves, and could eventually cut costs and improve consumers' experiences in stores, through better stocking and supplies. Simultaneous "one shot" scanning of goods at the cash. For example, everything in a consumer's grocery cart can be scanned all at once, while still in the cart-no need to remove items for check-out. This could speed things up at the grocery store. Use of RFID isn't limited to the retail sector. The pharmaceutical industry is already exploring how RFID tags could help identify counterfeit, and potentially harmful, drugs. Some have suggested that RFID monitoring of seniors' nutrition habits or use of appliances could make it easier for people to keep living in their own homes, instead of moving to care facilities before they actually need to. Airports may also find a use for RFID tags, to automatically detect luggage loading errors before bags go astray. Further investigation is required before any of these uses could actually become common. According to the European Commission, RFIDs are relatively low powered, compared to other wireless applications such as cellphones, broadcast media, and radar. Thus RFIDs may pose a lower level of risk to health than most other common wireless devices. With respect to consumer products, harmful health effects that may result from exposure to wireless magnetic fields have not been documented at this point, however controversy exists in this field. How could RFID affect privacy? RFID technology poses some challenges for consumers. 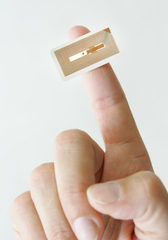 RFID tags can be very small, and the reader can be located where you can't see it. This can make it hard for a consumer to even know that RFID is being used by a store. When you do find an RFID tag on your purchase, you can't tell by looking at it whether the tag is still communicating its data, or has been turned off. It is theoretically possible that a tag can continue to be read, even after a product is paid for and taken from the store. An RFID tag used for inventory control might only contain information about the product concerned. However, the potential exists for a computer system to link this product data with personal information, as it is collected with every swipe of a credit, debit or loyalty card. RFID technology could make possible the creation of a detailed profile of an individual consumer's buying habits. RFID is a new and unfamiliar technology, and it is understandable that consumers might have questions about it, or be to a certain degree uncomfortable with it. Consumers should not hesitate to ask for more information and clear explanations from retailers who use the technology. What information is stored on the tag? What is the tag linked to? What is the company using the tag for? Is the tag still activated, and who can read it? How can I determine precisely when and how it is turned off? If the tag contains, or can be linked to, my personal information, what measures do you have in place to secure my privacy? And why do you need to have my personal information on a database? What is being done to protect my privacy? Your privacy rights are protected by Canada's privacy legislation, which will apply to any future RFID applications that hold or become linked with personal information. Under the federal Personal Information Protection and Electronic Documents Act (PIPEDA), there are ground rules that govern how organizations may collect, use or disclose personal information gained in the course of commercial activities. Those living in Québec, Alberta and British Columbia can also refer to their jurisdiction's provincial personal information Act . Ongoing discussions are also taking place, in Canada and internationally, about technological standards for RFID tags and systems; such standards could offer further protections for consumer privacy. Consumers should have control over the information that the store's computer system retains about them. As the use of RFID technology expands, so will consumers' questions about it. This article has been an introductory overview only — Canadians should keep asking for further information from governments, consumer organizations, and businesses. For further information, start by having a look at the following websites. Canada's Office of Consumer Affairs encourages you to be an informed consumer! Health Canada's mission is to help the people of Canada maintain and improve their health. The Consumer Product Safety Directorate deals with reports of consumer product-related health or safety concerns from industry and consumers. Industry reports are received under section 14 of the Canada Consumer Product Safety Act and the Cosmetic Regulations made under the Food and Drugs Act. Once the form is complete, go to section 8 and select "submit online" from the drop-down list. For the Additional Documents form, go to section 4. Follow the instructions to send your form. If the form has been submitted correctly, you will be re-directed to a page that says that "your file was successfully submitted"
If you experience any issues with submitting your form, please contact us at CPS-SPC@hc-sc.gc.ca for assistance. If the incident you are reporting resulted in a serious injury and medical follow-up may be required, please contact a physician or seek medical attention immediately. Health Canada's policy is not to disclose personal information, unless the individual to whom the information relates consents to the disclosure or the disclosure is required or otherwise authorized by law. Reports of health and safety incidents involving consumer products and/or cosmetics can be submitted by telephone or e-mail, or through the form provided above. What happens when I submit my report? When received, your incident report will be reviewed to determine if further information is required and if the Consumer Product Safety Directorate is the appropriate organization to address your concern. If the report does warrant further consideration, you may be contacted by the Directorate for more information. If the Directorate is not the appropriate organization to deal with the incident, you will be directed to the correct organization (including its name and contact). Your report will be forwarded only with your permission. Since the Directorate deals with many reported product-related issues, all reports are initially prioritized according to the health and safety risk. Incidents representing a higher risk will receive priority attention. Actions taken by Health Canada will be consistent with the Directorate's compliance and enforcement policies and procedures. The objective is to achieve compliance using the most appropriate level of intervention. Not all reports will lead to further action from Health Canada. What incident information is recommended in the submission of a report? Was the company notified of the incident? If so, what was the response? Place of purchase: why is this information required? Information regarding the specific store is important if Health Canada is required to contact or visit the location. Manufacturer/Importer address, place where the product was manufactured or imported from (usually found on the label or packaging of the product). Product UPC (provide all numbers listed), model number, lot number, serial number, other unique number, date of manufacture/import. Age recommendations found on the packaging of the product. Do you still have the product?